SmugMug Events is not a workable solution for me. It's far too complicated, and my clients won't use it for that reason. What's needed is a simple way for anyone, without prior registration or authentication, to review images in a gallery quickly and easily (i.e., navigation and image rating all done using keystrokes, no mousing required) and then submit the results to the photog with one click. The photog must get the results in a form which is quickly and easily used in Lightroom. At a minimum, this would be a CSV file which can copied/pasted into Lightroom's Library filters. The ideal implementation would be full integration with SmugMug's Lightroom plug-in. The lack of this critical feature is costing me $30/month for a third-party solution. It's also having a negative effect on my customers' perceptions of SmugMug, as they question why a third-party solution is needed. I’d love to understand more about what makes the Events system too complicated. Would you mind elaborating? While the system is old and in need of an update, I’ve been successfully using it and it’s been super handy since I do all my editing in Lightroom; being able to sync the favorites straight to lightroom has been a godsend saving me tons of time and frustration. My workflow for sharing images with clients is simple: I edit them in Lightroom, and publish them to SmugMug. Using Events requires creating the Event, customizing its settings, guest registration, identifying participants, etc. These are all extra steps which waste my time. Worse, my clients don't want Events, because my clients expect their online photo experience to be as simple as Instagram. Bespoke URLs, guest lists, participants, etc. are all barriers. Signing up is off the table. If they don't sign in somehow and you don't have specific URL's for the client, how would you expect to share the photos without allowing others to muck with the client picks (favorites)? If you want more than one visitor to pick favorites from the gallery, how do you expect them to pick their favorites? How do you expect to see which favorites each person selected? If you want to reach out to the visitors who might not have purchased so you can potentially win them back? (ex: your client shares the gallery with their family members but the family member doesn't buy a photo. For the holidays you run a promotion and want to offer a coupon for a sale). Instagram requires the viewer to login to favorite, comment, etc. Since you mentioned as simple as Instagram, would requiring them to login to some service be acceptable? > If they don't sign in somehow and you don't have specific URL's for the client, how would you expect to share the photos without allowing others to muck with the client picks (favorites)? One URL exists for all users. Any user can visit the URL, pick favorites (or rejects), enter their ID (email address, name, account code, whatever), and click Submit. I get email with the client's selects. This isn't great if a client wants to make repeated visits and have their selections persistent across visits -- but the work I do doesn't typically need that. My clients typically make one visit, pick their images, and that's it. > If you want more than one visitor to pick favorites from the gallery, how do you expect them to pick their favorites? How do you expect to see which favorites each person selected? > If you want to reach out to the visitors who might not have purchased so you can potentially win them back? (ex: your client shares the gallery with their family members but the family member doesn't buy a photo. For the holidays you run a promotion and want to offer a coupon for a sale). I'm not concerned with this, as my need is to serve clients who have contracted with me. > Instagram requires the viewer to login to favorite, comment, etc. Since you mentioned as simple as Instagram, would requiring them to login to some service be acceptable? Even if Events were friendly, it doesn't have the functionality I need -- which is to allow a client to pick both Selects and Rejects. Would love to know more about how you use the Selects and Rejects. Do you do anything in particular with the selects like continue editing them, turn them into prints/books? The rejects get removed from your website but all the rest stay? Obviously Cyrano has his own needs, but I can tell you how I would use this feature - I do a lot of image licensing and often get a call asking to see what I have for a given subject, for example Natural History Magazine asked to see everything I had on a list of specific wildflowers blooming at Kelso Dunes for a multi-page spread they were doing. I prepare a private gallery for the client to review. The client lets me know what images they want, and after preparing the licensing agreement and invoice I send them a link to a gallery where they can download the full res images (or send them via DropBox depending on client's preference). As it stands now, my client has to manually write down and send me the file numbers of the photos they want. This is not an appropriate use of Events. Events is better suited to...events. I should be able to just create a regular private gallery, upload the photos, send my client the link, and let them click a button to choose what they want. Personally I don't even need an e-mail or csv file (although I understand how that could help others), I just want an easy way for clients to select their choices without having to log-in, register, or be set up as a Participant or me having to jump through the hurdles of creating an inappropriate "event". I did create an Event once, for an event, and I don't intend to ever create one again. This was originally requested on User Voice in 2009 and it had over 400 votes when it was marked Completed because SmugMug created Events, even though there are a lot of comments on the request saying that Events are not the answer. There was a new request created in 2010 with another 256 votes asking to allow client favorites without having to use Events. In 2015 we were told that SmugMug hoped to open favoriting to all galleries "some day" and to follow that 2010 request for the status. Sometimes us old timers get tired of asking. As it stands now, my client has to manually write down and send me the file numbers of the photos they want. This is not an appropriate use of Events. Events is better suited to...events. I should be able to just create a regular private gallery, upload the photos, send my client the link, and let them click a button to choose what they want. Personally I don't even need an e-mail or csv file (although I understand how that could help others), I just want an easy way for clients to select their choices without having to log-in, register, or be set up as a Participant or me having to jump through the hurdles of creating an inappropriate "event". I did create an Event once, for an event, and I don't intend to ever create one again. I'd love to understand a little more about what made the process feel like hurdles. Is it just the name "Events"? What if the feature was called "Client Proofing", "Favorites", or some other name? The current process certainly requires extra steps but I'm trying to understand what makes it cumbersome. When we improve the feature I want to make sure to remove those pain-points but I'd love to understand what makes it complicated, cumbersome, difficult to setup. Does the 2 minutes you saved from not setting one up outweigh the pain of your client having to manually write down the file numbers, then find the photos, put them together and into their own gallery? How so? I use Events for all sorts of things -- any time I want someone to let me know which one(s) are their favorites. I can set it up in ~30 seconds, send the person a unique URL, and they can begin favoriting without having to do anything except click the heart. Then I refresh Lightroom, all their favorites are right there, re-edit those, and then quickly re-publish. Good riddance to making the client send me a list of file numbers, find those file-numbers in LR (which isn't easy for ... imagine typing "DSC0001", "DSC0104" ... 100 times), save them to a collection in LR, then upload that collection. It's literally just "Sync Folder" - to Get all the Favorites -> Select All -> Create New Gallery -> Publish. When you say "Events is better suited to events" - why do you feel that way? When we go to separate favoriting from events I'd like to make sure it doesn't still feel that way! Believe me when I say this is something I'm super passionate about (actually, many of us are pretty passionate about this topic). It was actually the first project I worked on when I joined the company, but I scoped it a little too large, new priorities came in and we went off to tackle some other things (like Coupons improvements, SSL for Custom Domains and a mobile-friendly shopping cart). Maybe part of the difference is because I haven't been syncing my site with LightRoom and I don't use LR for everything. Finding the correct file in my archives is easy for me, when I set up my current DAM workflow 12 years ago I began using a unique file name for each image that tells me exactly where to find it in my archives. I don't search for it in LR, I go directly to the file on my drive when I need it. First I have to create the review gallery and this is probably a big difference - I don't do this in LR since these often aren't photos from a single commissioned shoot, they are photos I select from my existing archives. Anything pre-2015 isn't in LR until I add it so it's usually easier and faster for me to drag-and-drop than it is to import multiple galleries into LR before I can do anything, especially if I'm in a rush. Then I would have to create an Event and add that gallery to it and add my client as a Participant. After the client selects favorites, yet another folder is created in an entirely different place (Event Favorites) on my site. I had to go into the Organizer to figure out where to find it. Since I don't usually sync with LightRoom I can't find an easy way to access the Event Favorites folder outside of LR without going through the Organizer. (I'm in the process of syncing to LR right now and I do see where it shows up in LR, but I apparently have several thousand conflicts to resolve before syncing can finish because I've been using Photoshop since the 90s & have a lot of .psd master files. Now I remember why I decided I wasn't going to bother with syncing my site to LR!). 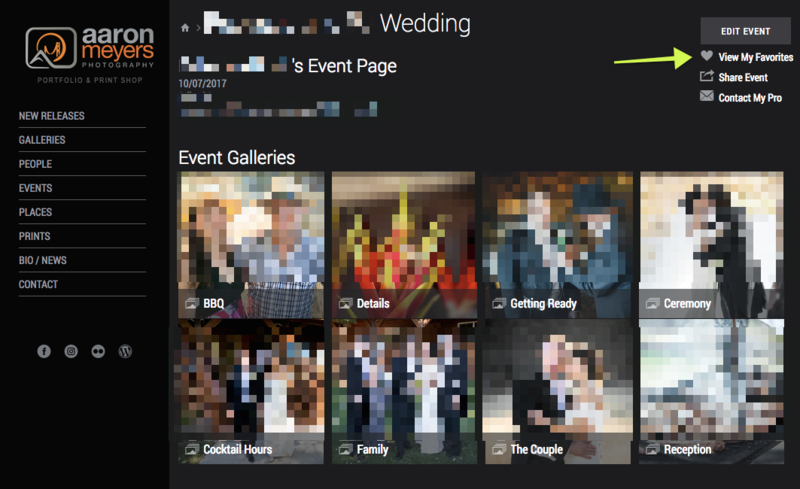 The first time the Events Favorite folder is created (when someone actually favorites an image) it defaults to Public Visibility and searchable on the web. Only after the system creates the folder can the owner access the privacy settings. Not an issue after the first time someone favorites an event photo, but it was something I didn't realize until after the fact. I think that folder should default to Private. The link sent to the client contains the word Event because the word Event is in the breadcrumb when they visit my site. So yes, calling it Client Review/Client Proofing or something like that would be much better. Even though I only add one gallery to an Event, the e-mail link takes the client to a page called "Participant's Event Page" and shows the words "Event Galleries" (and then that one lone gallery). I'm sure I could change the wording or remove it entirely by playing around with the code, but that's more work. From there it requires another click on their part to actually view the gallery. It's not a smooth process for them and use of the word Event throughout gives the wrong impression. I prefer to send them a link that will take them directly to the gallery. You can't see the unique Participant's share link (you only see the Guest share link) to send it to them directly, and the automated e-mail sent contains a lot of SmugMug branding, not my branding. It even says the e-mail was sent by SmugMug, not by me (although I can add my name). The only way around it is to send myself a test e-mail, get the link from that, and then send it to the client directly from my own e-mail account. More extra work. I think the process you described probably works well for wedding, portrait and event photographers, and for commissioned shoots. It just doesn't work for me when I'm licensing images from my archive and need to quickly put together a review gallery, and I would love to have an easy way for a client to make selections. But I do realize that I'm probably in the minority and I'm interested in hearing others' thoughts. Thanks for the really detailed explanation. That's quite helpful! (I'm in the process of syncing to LR right now and I do see where it shows up in LR, but I apparently have several thousand conflicts to resolve before syncing can finish because I've been using Photoshop since the 90s & have a lot of .psd master files. Now I remember why I decided I wasn't going to bother with syncing my site to LR!). In case it helps for the future, you can just do a Sync on a specific folder or gallery. When I have a client mark favorites, I just right click on the "Events Favorites" folder, and do a sync on there. Only their new favorites end up syncing and I don't have to worry about conflicts with syncing the entire site. It might help you a little. (and I still want to work on a better interface for dealing with hundreds/thousands of sync conflicts). A Private gallery wouldn't allow the client to see their favorites, but an Unlisted one might. At a minimum we could also turn Searchable on the Web to OFF by default for these. Yes sorry, I probably did mean Unlisted. But I'm not clear on understanding, since the Favorites gallery is created in a different place/folder on our websites, how would the client know where to find it? Do they receive another e-mail with a new link to the newly created Favorites gallery? I assumed they would just see their favorites in the original gallery, and that only we would see the newly created Favorites gallery. I understand the thought process behind having two separate galleries for us on the back end, but I think it would be confusing for the client to have one link to the full gallery and another link to just their favorites. So I guess what I'm asking is, does the client need to be able to see the Favorites gallery? Thanks for the tip, I did notice that now that I've started the sync process (actually an update from the last time I did it years ago) and now have the complete updated folder structure, I can just update a specific folder or gallery. since the Favorites gallery is created in a different place/folder on our websites, how would the client know where to find it? Do they receive another e-mail with a new link to the newly created Favorites gallery? I assumed they would just see their favorites in the original gallery, and that only we would see the newly created Favorites gallery. I understand the thought process behind having two separate galleries for us on the back end, but I think it would be confusing for the client to have one link to the full gallery and another link to just their favorites. So I guess what I'm asking is, does the client need to be able to see the Favorites gallery? (the "Edit Event" button wouldn't be there for the client. Sorry that my screenshot wasn't properly done). My client reviews the images. Those which the client wishes to purchase are marked Select. Those which the client wishes me not to use in my portfolio are marked Reject. I send to my client their Select images, and I delete from the gallery their Reject images. I make the gallery visible to the public as part of my online porfolio. To post the images for review, I use only my normal LIghtroom-based workflow, which includes publishing to SmugMug via the excellent Lightroom plug-in. That's it -- no extra time wasted in creating invitation lists, Event structures, permission hierarchies, etc. To review the images, my client uses only the normal SmugMug gallery/folder interface. That's it -- no extra time wasted in registering, signing in, etc. A quick and easy mechanism exists to transfer the client's Select/Reject choices to my desktop-based Lightroom catalog. Ideally, this would happen automatically via the SmugMug/Lightroom plug-in. Given the overall sophistication and quality of SmugMug, I don't understand why providing this capability has eluded the SmugMug development team for 8 years. Aside from not having an easy system for “rejects”, that’s mostly possible with the Events system. It’s obviously a little work for you to setup but it satisfies all 3 (Lightroom, client clicks a link and doesn’t have to register, the LR plugin identifies your favorites). Comments require sign-in. Would it be low-hanging fruit to add another icon to the existing choices for Events image review, to indicate disapproval? For instance, immediately next to the Heart icon, one might see a "thumbs down" icon.